Auslogics Disk Defrag 8.0.18.0 Portable » TopFreeSoft.Net - Best Freeware Software! Disk fragmentation leads to system slowdowns, PC crashes, slow startups and shutdowns. Auslogics Disk Defrag is designed for fast optimization of modern hard disks. Use it together with Auslogics BoostSpeed to get the top performance out of your expensive hardware. Auslogics Disk Defrag was designed to remedy system sluggishness and crashes caused by disk fragmentation. It is optimized to work with today's modern hard disks. Auslogics Disk Defrag is extremely simple to use, does not require any analysis phase and is faster than most of the other disk defragmentation software. It will help you get the maximum performance out of your expensive hardware investments. Fragmentation is caused by creating and deleting files and folders, installing new software, and downloading files from the Internet. Computers do not necessarily save an entire file or folder in a single space on a disk; they're saved in the first available space. After a large portion of a disk has been used, most of the subsequent files and folders are saved in pieces across the volume. When you delete files or folders, the empty spaces left behind are filled in randomly as you store new ones. This is how fragmentation occurs. The more fragmented the volume is, the slower the computer's file input and output performance will be. Defragmentation is the process of rewriting non-contiguous parts of a file to contiguous sectors on a disk for the purpose of increasing data access and retrieval speeds. Because FAT and NTFS disks can deteriorate and become badly fragmented over time, defragmentation is vital for optimal system performance. One of the fastest defraggers in the world, Disk Defrag often takes less than 10 minutes to defragment an average-size hard drive. Works the way you want. You can use the default settings for convenient one-click defrags or customize program operation and appearance to fit your needs. System files smart placement (This feature is disabled by default. You can enable it under the Algorithms tab in the program settings). Moving regular files from the MFT Reserved Zone to the rest of the disk space. Disk Defrag is supplied with a powerful engine that allows defragmenting multi-terabyte drives. Disk Defrag detects whether your system drive is an SSD and perform SSD optimization instead of regular defragmentation on it. SSD optimization uses special algorithms that safely optimize your drive and help extend its service life. If for some reason you would like to use regular defragmentation on your SSD drive, you may do that with Disk Defrag, but you will need to manually select this option for your SSD. Auslogics Disk Defrag works well for RAID disks too. The RAID controller still presents the RAID disks as an NTFS storage to the file system and therefore Auslogics Disk Defrag will not do anything differently for RAID arrays. C:\Windows\Temp. This can significantly improve the defragmentation speed. Sometimes Disk Defrag skips certain files because they are locked by another running program. Common solution would be to exit all running applications when you defragment your disk. Some files (MFT, etc.) are skipped because they are system files and cannot be defragmented by this program. Disk Defrag also needs a contiguous disk space for each file to be defragmented. 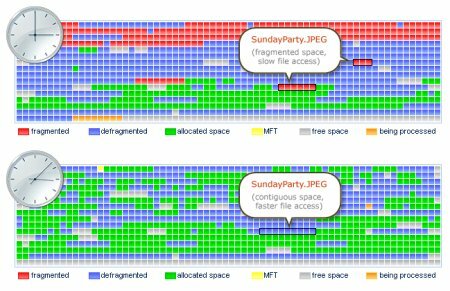 If your disk has a lot of free space, but it is broken into small free space intervals, Disk Defrag is unable to defragment some of the large files (such as movies, etc.). To tackle this problem, you can run 'Defrag & Optimize' mode. It will consolidate free space into a contiguous block and defragment even the largest files on your disks. Disk Defrag can defragment hard drives with as little as 1% of free space available. However, better results can be achieved if there is at least 10% of free space on the disk. Single file or folder defragmentation. Special algorithms for VSS-enabled drives. Disk error check and repair. Automatic defrags in real time.